In 1906, the great French stage actress and early film star Sarah Bernhardt embarked on her (first) Farewell America Tour. Her itinerary included a swing through Texas with shows in Dallas, Waco, Austin, San Antonio, and Houston. It was during that string of performances that the world's most famous actress, accustomed to playing for kings and queens on the biggest stages in Europe, performed in a tent. Normally a celebrity of her statue would have commanded the biggest venues in the Lone Star State, but the Divine Sarah fell victim to a bitter struggle between a powerful theater syndicate and a group of independent operators. The syndicate owned most of the large theaters in Texas and tried to control the others. Since Bernhardt came to America under the sponsorship of a company not associated with the syndicate, she was not allowed to play the large syndicate-controlled auditoriums. Even some small theaters were afraid to book her for fear of angering the syndicate and losing access to its other attractions. But no one could change the mind or the plans of the fiery French actress. Texas would see the Great Bernhardt, come hell or high water; even if she had to perform in a circus tent. For that purpose her booking agent made arrangements to rent Barnum and Bailey's largest big top, but it would not conform to the stage requirements. So Sarah had one custom-made in Kansas City. When fully erect it covered 150 feet by 260 feet with a seating capacity of several thousand. The tent was so big it took three train cars to carry it and an army of men to put it up and take it down. The Texas tour got underway on March 26, 1906, when Madame Bernhardt and her troupe arrived in Dallas from New Orleans. A Katy locomotive shunted the French star's special train of eight cars onto side tracks near the cornfield where her tent would soon go up. The train included Madame Bernhardt's elegant private car, two Pullmans, two coaches, and three baggage cars. 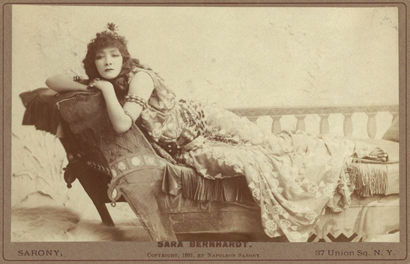 In addition to her own acting company from the Theatre Sarah Bernhardt in Paris, she traveled with two maids, two men servants, a masseuse, a private secretary, a personal cook, her pets, the man who took care of her pets, and 300 pieces of luggage. In Dallas the tent went up in good order, but as darkness approached, trouble started. When a large crowd gathered several hours before show time, management decided to open the flaps, and several thousand people surged inside. Some had purchased tickets (ranging in price from $1 to $3); others had not. Before order could be restored, hundreds more had broken in. The police had to be called out to avoid a riot. The play Madame Bernhardt chose for her Texas tour was the French classic "La Dame aux Camelias" by Alexandre Dumas, fils (Jr.) - a lusty tale about "a French woman of ill-repute, of her love for a man, of his love for her, and of their sorrows, separation, and reconciliation at the hour of her death." The storyline was shocking for many Texans of the time, but on this night, no one seemed to mind. Besides, only a few spectators in the front rows could actually see or hear the actors, and most of those in hearing distance could not understand the heavy French accents coming from the stage. The odd mixture of Texas and France under a tent in a Dallas County cornfield moved a visiting New York Times reporter to poetry. the ceiling flounces to and fro; the walls bulge out and flap. After opening night in Dallas, the show moved one hundred miles south to Waco. The tent went up in Padgitt Park near the site of the old Cotton Palace. This time the crowd was orderly, but its size was disappointing. Madame Bernhardt's third tent show was scheduled for the following night in Austin on a site near the state capitol. While workers put up the tent, Sarah met Governor Lanham and briefly visited the state legislature. It was raining in Austin that morning, and continued to rain throughout the day. When Madame Bernhardt inspected her canvas theater that afternoon, it was a muddy mess. Water coursed through the aisles and under the seats. This would not do. The world's greatest actress could not perform in a mud hole. So Madame Bernhardt called for her car and ordered the driver take her to the Hancock Opera House at 120 West 6th Street. She marched inside, summoned the manager, and demanded that she be allowed to perform there that night. When management hesitated, the real theatrics started. According to one newspaper report, Madame Bernhardt and her entourage "commandeered" the theater. Sarah also ordered the manager to provide a stage crew. Under the difficult circumstances he was in the manager gave permission for Bernhardt to use the theater, although it was rumored he did so only after the Texas attorney general intervened on Sarah's behalf by threatening the theater with a violation of anti-trust laws. Management, however, refused to provide a crew, so Madame Sarah herself went out on 6th Street and rounded up a crew of stagehands. That night, with the governor, lieutenant governor, and many members of the legislature in the audience, she played the opera house in Austin. Sarah Bernhardt used her Texas tent one last time in Chicago on April 26, 1906, in a show to benefit the victims of the recent San Francisco earthquake. After that a California company bought the tent to use as a make-shift auditorium to replace San Francisco's Central Theater destroyed in the catastrophe. Waco Daily Times-Herald, March 18, 1906, March 24, 1906, March 26, 1906, March 28, 1906. New York Times: March 27, 1906, March 28, 1906, March 29, 1906, April 27, 1906, May 27, 1906.